I have a special place in my heart for church architecture. Everything has meaning–the stained glass windows, the iconography, the symbols on the altar, even the layout of the sanctuary. It represents the divine and the incarnation and it’s a comfort to pause each week and consider the larger picture of eternity. One particular sculpture in my husband’s church has delighted me over the years. Probably because I’ve never seen the Virgin Mary depicted in such a way. Who knew that Mary was a spinner? 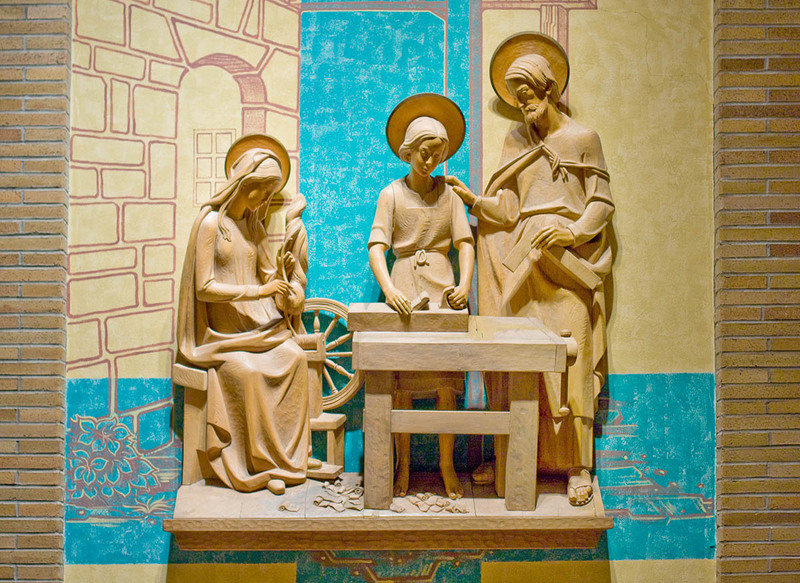 If you look closely, she is spinning fiber from a distaff on a spinning wheel while Jesus and Joseph work at their carpentry. I love the implication that she created yarn in the midst of being mother to the Messiah. I can’t say that my spinning or weaving reaches heavenly heights, but it’s nice to think that fiber was part of the daily rhythm of the Holy Family.